Traveling for work can be a fun and exciting life – if you're smart about it. Time and tide wait for no man, and Boeing 747s aren’t much more patient. While few careers are as rewarding as those which require travel, there are likewise few more challenging (it’s not all jet-setting and attractive flight attendants). Connections, layovers, the sudden realization that your fellow passenger will probably try using you as a flotation device in case of an emergency – these things can be overwhelming to even the most daring. Fortunately the following tricks, taken from the pros themselves, will help you navigate not only the friendly skies, but the airports, the third world countries, and the long, lonely days in hotel rooms, without breaking a sweat. The brilliant strategist Sun-Tzu once said “The wise warrior wins first, and then goes to war.” Preparation is just as vital in travel as it is in battle (and if you’re trying to change planes at O’Hare, it pretty much comes to the same thing). When your fellow travelers are milling around in a state of bleary, jet-lagged despair, you will be at the gate already, planning your next move. While you should always be checking (and double-checking) for the cheapest flights, recent studies have shown that they’re typically at their lowest prices 54 days ahead of time (though that number’s much higher for international travel). And of course, that’s only the first cost. Domestic flights typically include a fee for any checked luggage, usually around 25 dollars. Although your employer might provide you with a travel budget, that’s still going to start adding up fast, so strategic packing is key. Clothes (let’s face it) will need to be worn more than once to save space. Try to include a set of “casual wear” for around the hotel and during your free time to save your business wear from any unnecessary use. And don’t forget that what you pack is just as important as what you pack it in. Carry-ons and checked luggage with wheels is a necessity here. That guy desperately fumbling for his tickets while his half-zipped backpack scatters dirty socks across Terminal B? Yeah, that’s not you. A four-wheeled rolling case is not only infinitely easier to handle, but tends to be a bit more durable as well. Airports can be hectic places, and the only way to save time is to give yourself time. Get to the airport 90 minutes ahead of departure – 2 hours, if you’re flying internationally. As security measures become more and more strict, it’s vital that you give yourself some wiggle-room. Understand the TSA choreography ahead of time and you’ll spare yourself (and everyone else) plenty of hassle. Shoes and jackets are going to have to come off (you should avoid wearing a belt) and you’re going to want to be putting these through first (along with liquids, keys, phone, and anything you might have in your pockets). Your laptop and electronics are going to be scanned separately from the bag they’re carried in, so be unpacking those and send them through second. While you’re waiting for them on the other side you’ll have time to get your shoes back on, and only have to scoop your electronics back into your carry-ons before moving on confidently and (above all else) swiftly. It’s bad enough to be scrambling to get yourself together, but you definitely don’t want to be the reason someone else misses their flight. That is, of course, if you want to bother with security lines at all. Some simple paperwork and a mere 85 dollar fee will get you a five year membership in the TSA’s Pre-Check system (Global Entry, the international version, is fifteen dollars more). At its core, this is an expedited security check specially designed to ease the lives of frequent flyers. Shoes, belt, and jacket can all stay on, your laptop can stay in its bag, and, above all else, the lines are infinitely shorter. Time is money, and that little investment in the here-and-now will pay for itself a hundred times over. 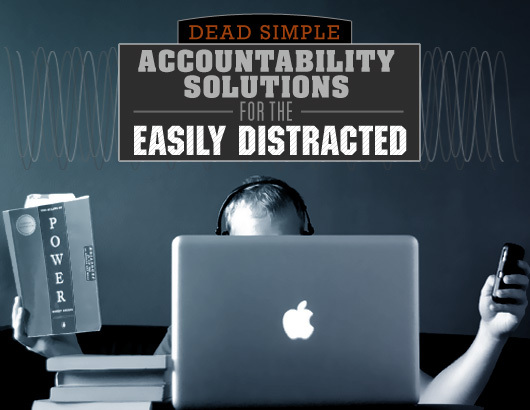 Of course, having too much time can be just as much of a hassle as not enough. Getting stuck inside the terminal can be maddening (there’s only so many times you can browse through the bookstore). While there are some airports that offer complimentary WI-FI, these are still few and far between. And though some will allow you to purchase their wireless connection, these can be insecure and often require a separate fee for each device you want to connect. The seasoned traveler, however, will know to use a USB hotspot or enable tethering to turn the simple smartphone into a wireless connection for his computer and other devices. This is going to be eating data and your mobile’s energy, but it’s nothing a solid phone plan and power cord can’t handle. 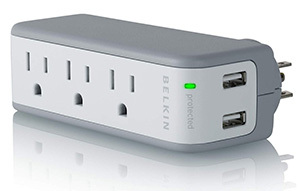 Get yourself an outlet-splitter like the Belkin mini-travel surge protector with 3 outlets and 2 USB ports, an essential tool of the frequent airport dweller. An unclaimed airport outlet can be more elusive than Sasquatch, and an outlet splitter will let you charge multiple devices at once (sparing you the “battery life low” message’s mocking chime and the anxiety of going off the grid). These also come in handy in hotel rooms and cafes along your way. If your work isn’t reimbursing you for your expenses, hotel wifi can be a huge unavoidable budget-buster. Eric Friedlander, whose job requires him to travel upwards of 50,000 miles a year, always packs a long cat-5 ethernet cable for free (and faster) hotel internet. If you’re flying internationally the bulk of your travel is going to be on the plane itself and, once again, careful planning is going to be required. For maximum comfort, be sure to wear something light and breathable. There’s nothing worse than being stuck on a plane (or worse, in an airport) in uncomfortable clothes. 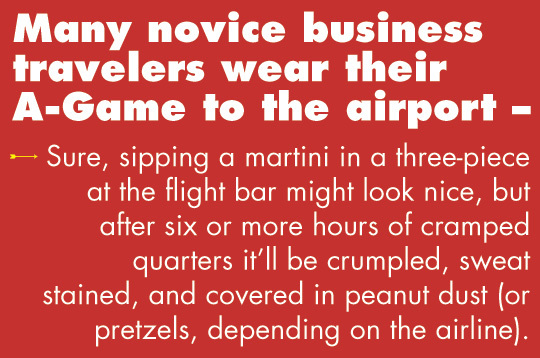 Many novice business travelers wear their A-Game to the airport – sure, sipping a martini in a three-piece at the flight bar might look nice, but after six or more hours of cramped quarters it’ll be crumpled, sweat stained, and covered in peanut dust (or pretzels, depending on the airline). And as mentioned earlier, you’ll likely be wearing these items multiple times over the course of your trip. 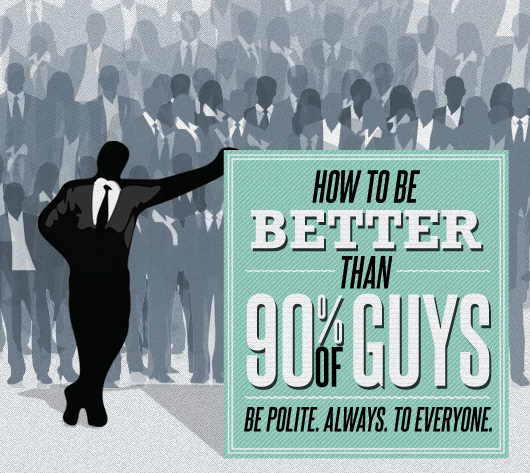 Save the suit for your big presentation and the celebratory drinks afterwards. The only thing better than getting paid to travel is getting paid to travel overseas. How many people will ever get to sip coffee in the Latin Quarter or ride a bamboo raft down the Mekong River? If you’re going to be a real globetrotter, you’re going to need to keep a few things in mind. Language barriers can get you into a world of trouble if you don’t know what you’re doing. While English is increasingly common, you’re still going to need a back-up plan to prevent you from getting stuck in the middle of nowhere, arguing with a tuk tuk driver who only speaks Thai (trust me, I’ve been there and it isn’t pretty). You can save yourself plenty of headaches by printing out the name of your hotel in the local language; most folks are willing to help, so long as they can understand what you need. Even just skimming Wikipedia on local customs and culture will protect you from more egregious mistakes. In some parts of the world using your left hand is tantamount to giving someone the finger. In other parts, you’ll be expected to refuse something two or three times before you’re taken seriously. In this Information Age there’s really no excuse for being an “Ugly American”. Most nations have outlets with circular holes rather than slits (check out WorldStandards for a comprehensive guide on which nations use what). Another key to survival is making your hotel room feel as much like home as possible after a long day, and as with so much in life, it all comes down to the little things. Stow an HDMI cable to stream video from your computer directly to the room’s TV. Pack some snacks so you have something to eat when you get back to your room and the kitchen is closed. You may not be able to do your full-on workout routine but you must set aside time to exercise, whether that’s in a hotel fitness room, a day pass at a local gym, or bodyweight exercises and cardio. Unlike a vacation, this isn’t a time-out from life, this IS your life. Your goals and discipline can’t fly out the cabin door on takeoff. Staying in not your style? Then take as much advantage as you can of whatever travel expenses are afforded to you – try out the local delicacy, soak in the culture, go exploring. There’s simply no better time to expand your horizons than when you’re literally expanding your horizons, even if it means doing so on your own budget (Hipmunk is a great place discover decent and cheap lodging). The popular sights are always fun, but don’t be afraid to experience your surroundings like a local. 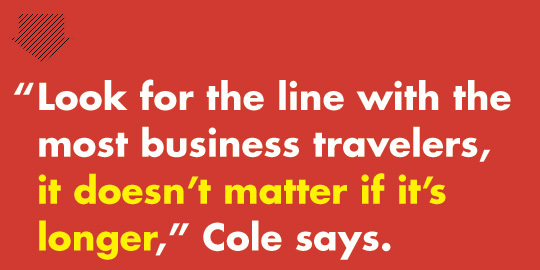 Get friendly with your waiters and servers, Cole suggests, “Don’t ask them where the locals hang out, ask them where they hang out after work.” You’ll get a taste for the culture that tourist traps will never be able to offer. Frequent flyer forums can also be a great way to discover your destination’s best-kept secrets (why stay at the Hilton when you can get that gorgeous ocean-view B&B for a tenth of the price?). Though still relatively new in some locales, services like Uber and Lyft can be great alternatives to expensive cabs – reliable, easy to document (for those dreaded expense reports), and using simple card payments instead of cash. Hectic airports, delays, a blur of different cities – all these things have a way of wearing on the soul like nothing else (though a great app like TripIt can help bring order to the chaos). If this is going to be your life (for the foreseeable future, anyways) then make it your life. VIP airport lounges and clubs are going to make all the difference in the world when you’re waiting on your 2nd transpacific flight this month. How’s it work? Well, instead of those plastic torture devices being passed off as benches, imagine a bright, airy room filled with sprawling cushioned chairs and couches, free internet, a bar, and sometimes complimentary snacks and fruit or even omelets. While the prices might seem formidable at first (about $500 a year) you can also gain access through simply being part of a frequent flyer program, or through a rewards credit card. You can even trade in flyer-miles for access. One way or another, the comfort and haven that these places can provide from all the sound and fury will be indispensable in keeping your sanity. Though all of that is sure to help it’s still not going to completely solve the problem. It’s here where you’re going to need to look to folks who know exactly what you’re going through. There are plenty of forums full of seasoned veterans more than happy to offer sage advice when it comes to making the most of this line of work (check out FlyerTalk). So find your gate and grab yourself a seat. Kick back with that one paperback you’ve been swearing you’ll finally finish. Dashing from gate to gate in a state of panic is for amateurs. Use these tricks, learn from the pros, and you’ll be soaring alongside ‘em before you know it. Real travel pro's are always in control even in seemingly uncontrollable situations. Be the best leader you can be, and never forfeit power. Bring two or three mini bottles of your favorite liquor. While I rarely end up opening these, they are indispensable when you need t make a friend on the plane. Also, any form of prepackaged wet napkin is your friend. These will clean up your face and hands in a heartbeat and make you feel human again. It’s actually illegal to open alcohol you bring on the plane yourself. So, I’d be a bit careful with this. Another tip for the security line is to wear a jacket (if you’re bringing one and it isn’t insanely hot in the airport). Wearing a jacket allows you to put all the items in your pockets (keys, phone, change, wallet, passport, even belt) into the jacket pockets while you’re still waiting in line to get to the bins. Once you get to the security table/conveyor belt, throw your bag on the conveyor belt, slip off your shoes and put them along with your jacket in the bin and you’re ready to go. After going through the scanning machine, simply find your stuff on the other end, slip on your shoes, throw on your jacket and grab you bag. This allows you to walk out of the security area and re-assemble yourself at your own pace rather than rushing to get out of the guy behind you’s way. To celebrate the 40th anniversary of the release of Jaws, we honor the timeless costume design with 4 inspired sharp and affordable outfits.